Shorewest, REALTORS® has been awarded third place in the Large Company category by Top Workplace of The Milwaukee Journal Sentinel. The list is based solely on employee feedback gathered through a third-party survey administered by research partner Energage, LLC, a leading provider of technology-based employee engagement tools. The anonymous survey measures several aspects of workplace culture, including alignment, execution and connection, just to name a few. Shorewest is proud to be a Top Workplace for eight years in a row. The company takes pride in fostering a family feeling with understanding, compassion, balance and support, says Horning. He and his brother John P. Horning, Executive Vice President, are the third generation to lead Shorewest and its family of companies. Shorewest began in 1946 by their grandfather John A. Horning as Wauwatosa Realty. Over the past 70 years, Shorewest sales associates, managers and team members live out the mission that was created and the company was founded on: We are a team…proudly independent; dedicated to serving the housing needs of Wisconsin; committed to unsurpassed customer service; pledged to share our talents for mutual growth and prosperity. They truly care about their clients and customers. Shorewest is a company that is family oriented and truly cares about each of its family members. When team members and agents begin their careers at Shorewest, many have found a life-long fit because of the immense amount of support available. Shorewest provides top training, coaching, tools and resources for agents to succeed in the real estate industry, along with flexible schedules that allow agents to have a work-life balance that fits their individual needs. Shorewest also provides national speakers at company events and award-winning sales training programs for agents to participate in and increase their knowledge and growth. They also acknowledge the importance of recognizing a job well done. The President’s Club and Executive Club members and their guests have been treated to Broadway shows, wine pairing dinners, the Wisconsin Breast Cancer Showhouse Event, Brewer’s games and tailgating for the team members and so much more. 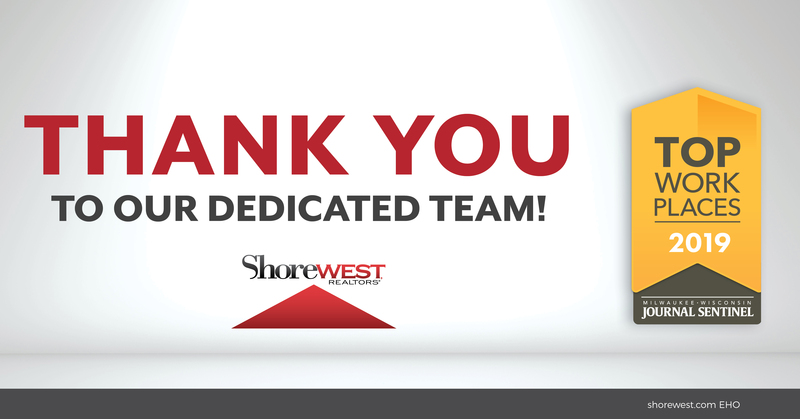 In addition to helping homebuyers and sellers, Shorewest is proud to be a member of the communities they serve, and contributing to their surrounding areas is always a priority. Shorewest’s own charity Christmas is for Kids (C4K) started helping families in need of Christmas spirit over 30 years ago, and is now a year-round cause that they support. Fundraising activities include a major C4K golf outing during the summer, chili cook-offs, auctions, bike rides and bake sales. Casual Days for a Cause provides support to charities that need financial help. Another highly successful initiative is the community engagement program which empowers each office to go out and participate in community events and charities. Shorewest also aids the Red Cross during disasters, blood drives, food drives, families needing medical assistance and other worthy causes. Shorewest is a sponsor of the Breast Cancer Showhouse. They also support United Way, UPAF, the Salvation Army and more. This is in addition to the countless parades that the Shorewest fire truck and army truck can be seen with their own President, Joe Horning waving behind the wheel. Supporting all of their giving spirit are the family bonds that hold them all together. A sense of family can be felt at Shorewest; from Horning Building Fest, where a fun summer tradition has continued over the years with light-hearted games and lunch shared by all, to the Holiday Cheer Party where the Shorewest Family can relax and enjoy each other’s company. Office Awards are given out each year to pay tribute to individual accomplishments and celebrate the longevity of team members. Shorewest has set the standard on how to bring a family culture to a Top Workplace environment — and to care about each and every customer and client that they serve.